The Abstract Point Of No Return (APNR) is an advanced concept; it is not for everybody. The APNR will deal with anticipatory anxiety, but only as the by-product of self-activation. Let’s get started and see if the APNR is for you or not. I want to direct you to the idea that the mind is not necessarily supposed to be at peace. The most eye-opening psychological essay I’ve read was written by psychoanalyst Charles Brenner, MD. He said psychotherapy does not cure conflict; rather, we are supposed to have conflict. Psychotherapy seeks to develop an arena within the person where the contest between aims that are conflict with one another can be consciously played out. Psychosomatic illness develops when hidden desires, wishes, loves, hatreds, and urges find expression as physical symptoms, phobias, or anxiety. When we act out, we go first in one direction, and then in another. As soon as one urge is satisfied, a different – perhaps conflicting – urge dominates. Awareness of conflict is uncomfortable. For some persons, awareness of conflict is overwhelming. To avoid being overwhelmed, they focus on one (potentially conflicting) urge at a time, and block conflict by keeping any conflicting urge, interest, or information out of mind. One of the goals of psychotherapy is to help the client build the strength to let more conflict come to mind. The mind needs to be the arena in which competing aims, desires, interests, and impulses can be reckoned with mentally. This allows the person to commit to a course of action (or inaction) as the author of what takes place, rather than as the victim of one episode of acting out after another. Being conscious of conflict helps the person avoid the debris, expense, and frustration that follows in wake of acting out. I didn’t know that conflict is something we are supposed to have and are supposed to be aware of. I can look back to years ago when I believed it was wrong to have – or to be aware of – conflict. I envied the spontaneity of people who acting out, and did whatever they felt like doing. As it turned out, over time, their lives became a mess, or worse. How can a person tolerate the feeling of intense conflict? Conflict is hard to endure. When stressed, we know how easily conflict could be gotten rid of; just let one urge take over. Just do it. Though letting one urge take over feels good for a moment, is often followed by remorse. I was not happy with my therapist when she told me that the hallmark of mental health is the ability to accept ambiguity. The journey from avoiding awareness of conflict to allowing awareness of conflict is long and hard. It may require the help of a therapist. So I will not ask you to take this subject any further. Instead, let’s go to what this has to do with flying. Anticipatory anxiety is about conflict: that’s pretty obvious when you think about it: the conflict is you want to fly and you don’t want to fly. Or, put another way, you want to fly but you don’t want the feelings the flight may cause. Perhaps it would be more accurate to say that some “part” of you wants to fly. Let’s call that part of you “part A.” No, let’s call that part of you “Orville” after Orville Wright, or “Jonathan Livingston Seagull” after the book written by F-86 pilot and author Richard Bach. But another part of you says, “No way” . . . if I get on that plane, I will have a panic attack, because I will know that at every moment I may be about to die. Let’s call that part, well . . . Linus . . . who needs soothing, not adventure. Internally, when it looks like Orville-Jonathan is getting the upper hand, Linus gets terribly upset. When Linus gets the upper hand, the far more adventurous Orville-Jonathan gets ashamed, frustrated, or angry. The Orville-Jonathan part of the person is happy only when engaged in growth or adventure. The Linus part is only happy clinging and making sure that nothing changes. The only thing the two parts can agree on is: “I want to be in control.” But, when Orville-Jonathan is in control, Linus screams bloody murder. And when Linus is in control, Orville-Jonathan feels ashamed. What can be done? I want to tell you a story, a personal story. Back when I was very busy trying to prove something – though if anyone had told me that at the time, I would have told them they were mistaken – I bought a race car. It was a Formula 3 Lola. I made arrangements for the purchase by phone. The car was in England. I was stationed in the Air Force in Germany. When I went to pick up the car, the seller had slipped off the fiberglass body so I could inspect it. It weighed only 880 pounds. It was constructed of triangulated tubing to which four wheels, and an engine and transmission were attached. In front of the engine was the driver’s seat, and in front of the driver’s seat, almost nothing. I pictured myself in the car’s simi-reclined seat. With my legs stretched forward, there was nothing between my legs and whatever I might crash into but some pieces of lightweight tubing. I got very uncomfortable. I had already paid for the car. We loaded it on a trailer and I took it home. Fast-forward to race day. The race will be starting in five minutes. It is time to get into the car. I stand on the seat, and start slipping my heels forward, forward, forward. I slide down into the form-fitted seat as though it is a body-sized glove. The seat holds me firmly on the sides, so I am supported when going around turns. Once in, it isn’t easy to get out. And this is what was so remarkable. It was as if that part of me which said, “You shouldn’t be doing this” got out of the car. I experienced complete peace. Never before in my life had I experienced a moment without some conflict. There has always been conflict between what I wanted to do and what I should do. Think once again of two parts, Orville-Jonathan and Linus. Commitment resolves the matter. Linus gets to of the car and goes away. Orville-Jonathan is free to drive. How does this apply to flying? Imagine you are in a room with several other people. And in that room, there is a huge sheet of steel suspended from the ceiling by a rope. And, there is a sledgehammer. Let’s say one person in the room grabs the sledgehammer, and slams it against that huge sheet of steel. It makes a horrendous noise. The noise bothers everyone in the room except one person. Who? The person swinging the sledgehammer. Why? Because he is not the victim of the action; he is the cause of it. There is a huge difference between an action you cause rather action that happens to you. It’s like the Simon and Garfunkle song, “I’d rather be a hammer than a nail.” When the door of the airplane closes, you are physically past the point of no return. Anxious fliers dread that moment. It takes away control and makes it impossible to use escape to get rid of high anxiety or panic. There are two ways to be in the plane: as the cause of what takes place or as the victim of what happens. When the door of the plane closes and you are physically past the point of no return, would you rather be the hammer or the nail? Would you rather be the cause of what is taking place or the victim of what happens? Instead of waiting for the physical point of no return, the Abstract Point of No Return establishes what will happen in advance. Here is how we set it up. As your flight approaches, consider the best and worst outcomes. Imagine the very worst your flight could be. You get on the plane, it takes off, and climbs to cruise altitude and then – though I can’t imagine how – your worst nightmare happens. The plane plunges. Imagine the best your flight could be. You get on the plane, they upgrade you to first class. You find yourself sitting next to your favorite celebrity, who is delighted by your wit and charm. The plane takes off and you hardly notice it. Cruise is perfect – not a ripple. The plane glides down to touchdown as smooth as silk, and you get off, and find you luggage made it, too. You could hope for a perfect flight. You could dread having a flight from hell. Neither extreme is going to happen. Your flight is going to be someplace in the middle, someplace between those extremes. 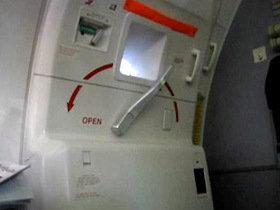 The door of your plane is going to shut. When it closes, are you going to be on the inside or on the outside? Instead of waiting for circumstances to determine which side you are on, you can be the author of what you do. You can make an irrevocable commitment to be inside the door or outside the door – and here is the kicker – no matter what, even if it kills you. Make the place you will be when the door closes as certain as if the door had already closed. Why wait for time and circumstances to disclose where you will be? Why should you not determine where you will be? If you can decide now where you will be when the door closes, you are beyond the point of no return – not due to circumstances – but by your commitment. Sitting on the fence allows you to become the victim of circumstances. If you determine now what you will do on a “no matter what” basis, you are the cause of what takes place.Commitment means what will take place is just as certain as if it had already taken place. It is a done deal. Take it to the bank. Why? Because you say so. You have chosen to be the author of what happens rather than the victim of circumstances. An amazing thing happens. The part of you that has been trying to find some way out of taking the flight, gives up. Conflict disappears. Anxiety vanishes. But, if commitment lapses, anxiety will return. You can remain anxious or you can make the commitment again. But remember the paradox. Making the commitment to make anxiety go away doesn’t work. Commitment comes from your sense of self and your resolve to be the cause of what happens. Once again, this is not for everyone. If you are just looking for relief, it’s not for you. If you are looking for personal growth, the APNR is for you. Clarification. Dr. Brenner said we are supposed to have conflict. He meant, I believe, being conscious of conflict can facilitate a stable compromise that considers all aspects of ones self, and allow the person to avoid the instability of unconsciously acting out one aspect of ones self after another.